Koi Kare are a experts in garden and fish pond construction in the UK we are based in Kent, we can build your pond using various construction techniques including liners, block & render and fibreglass. We have built raised ponds with large viewing windows to showcase your fish or Koi. 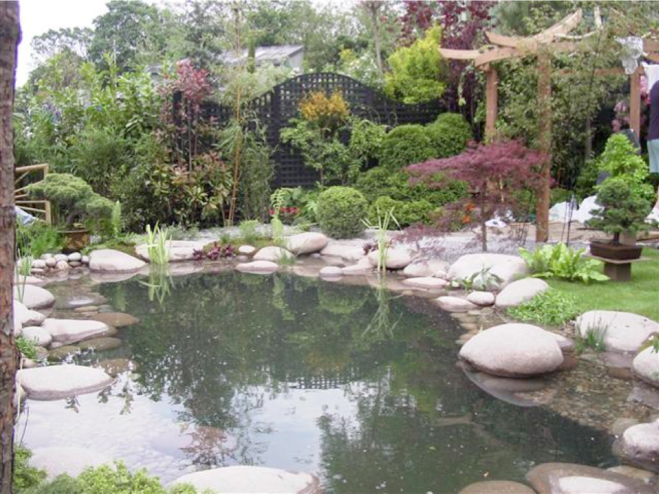 We don’t just build Koi ponds we can construct natural ponds that will enhance any garden. Before construction starts we will discuss the pros and cons of the pond location and mark out the construction site to your requirements. Clearly if your pond contains more than a few fish you will require a filtration system that we can design and install along with UV clarifiers to ensure your pond remains crystal clear. In the UK winter it is recommended that your pond is at least 3 foot deep. If required we can conceal the filtration equipment using decking etc. We are the only company ever invited to construct a pond and garden to exhibit Koi at the prestigious Chelsea Flower Show in the UK where we were awarded a coveted Silver Gilt medal. We work mainly across the south of the UK covering Kent, Essex, Sussex,Suurey and London but will travel elsewhere if required.